Born March 26, 1849 in Foggia, Apulia, Italy, Achille Luigi Carlo La Guardia was the son of middle class parents. Don Raffaele and Donna Rosa de Maria La Guardia were believing, practicing Catholics who had their son baptized on the day he was born. Don Raffaele was a minor municipal government official, thus entitling him and his wife to the designations "Don" and "Donna," respectively. The La Guardia family was large and Don Raffaele's employment provided for a comfortable, cultured home. Achille was schooled publicly and his education would have easily secured him municipal employment, a goal insisted upon by Don Raffaele. The younger La Guardia chaffed at his father's relentless insistence and the strict dogmas and harsh discipline enforced by the priest/teachers at school. He became frustrated and angry, which led ;to mischief. On one occasion, Achille placed a sharp object on his teacher's chair. The priest/teacher obligingly sat on it. When the culprit was apprehended, the offended priest sought repentance and restitution in the form of forcing Achille to lie on the floor and trace a cross-shape in the dust with his tongue. Humiliated yet defiant, Achille told his parents of his harsh treatment. Don Raffaele and Donna Rosa sided with the priest, promising more severe remuneration for future deeds. Angry and bitter toward Church and family, Achille ran away from home at age 13, vowing never to return to either. He remained faithful to that vow, although he did sing in the choir on Holy days and contribute to Church charities. When Achille left home, he took with him a talent for music and a driving desire to achieve. He entered the Naples Conservatory of Music in 1863 at age 14. He graduated at his third examination (i.e., year) with a diploma certifying him a professor of music and cornet soloist. During his study, "Achille...became a talented musician as well as a gifted composer and one of the leading cornetists of his time." After his graduation in 1866, he did odd jobs as he travelled about, but more and more, Achille began to support himself as a musician. Sometime between 1866 and 1870 Achille entered the Italian Army as a member of the 16th Infantry Regimental Band. He served until the end of the Italian Revolutionary War in 1870. Details of La Guardia's Italian Military service are unavailable, except for the fact that he was decorated by the Italian Government. After the was. La, Guardia travelled to Switzerland and may have been there four years. He continued to study and practice music, having much success leading musical ensembles there. In 1875, La Guardia became the leader of a military band in the Holland Colony in Batavia, India. He was employed in that capacity for a short time, possibly less than a year, when illness forced him to resign. He returned to Europe and found employment as leader of the Austrian Veteran Band in Trieste, Austria. In 1878, Achille made acquaintance with a Mr. K. Schreimer of Hamburg. Schreimer apparently had heard of La Guardia's musical reputation and hired him with a two-fold purpose: one, as a ship-board musician aboard the Hamburg Line and two, as an entertainer at the grand opening of the Long Beach Hotel, Long Island, New York. This offered an exciting opportunity for the talented musician. The grand opening of the hotel was successful, and La Guardia stayed on as entertainer until the end of the tourist season, when he moved to New York City. Armed with solid talent and a thirst for success, La Guardia soon began to move among the leading musical circles in New York City, and having had profitable ventures in America, Achille decided to settle in the New World-but not without a wife. La Guardia returned to Trieste where he met Irene Luzzato Coen, age 21, at a chaperoned dance. She was born in Trieste, Austria on July 18, 1859, a descendent of two prominent Jewish-Italian families, each having a long line of distinguished progenitors including military heros, civil servants, and university professors. Luigi Luzzatti (pluralization of name), Prime Minister of Italy before World War 1, is among this impressive genealogy. Irene's social status, poise and schooling were quite attractive to the well-travelled La Guardia. Although Jewish by religion, she was Italian in culture, another plus, and she was schooled in language, speaking her native Italian, some Hebrew, and German. Irene, likewise, was taken by her suitor's good looks, sophisticated worldly charm, and by the prospects of life in America. They were married by Ricci Bazzoni, the mayor of Trieste, on June 3, 1880. On the marriage certificate, Irene declared her religion as "Israelita"; however, she was not a practicing Jew. Achille, still bitter toward Catholicism, boldly scrawled "nessuna" (nothing) in reference to his own religion. The newlyweds sailed for New York City on their wedding day, barely six months after meeting. The La Guardia's first American home was a large red brick apartment building in Greenwich Village in a rather Bohemian setting. Here, immigrants of many European cultures pocketed together forming miniature countries in an effort to calm fears, ease homesickness, and establish roots in their new country. Achille and Irene were immigrants also, but they differed from the rest in two important ways: one, they arrived with money and two, Achille spoke English (which Irene was rapidly learning). Also, Achille had contact in America as well as employment potential as a musician. The La Guardia's first child, Gemma, was born April 24, 1881. Shortly after her birth, the family moved to a larger apartment building not far from the first. Here, Fiorello was born on December 11, 1882. It was during this time that Achille met Henry E. Abbey, business manager for the Adalina Patti Opera Company. Abbey was in the process of organizing an American tour for the Spanish-Italian operatic soprano, and hired La Guardia as arranger-accompanist. The tour included major cities in the Eastern states and an engagement at Wallack's Theater on Broadway in February and March of 1882. In 1883, La Guardia left his family in New York and travelled to St. Louis, Missouri to accept an engagement offer as cornet soloist at the Pope Theater, where he "won the hearts of the impulsive Southerners." During his stay in St. Louis, he also entered into the classical music publishing business. The business was short lived and La Guardia returned to his family. Upon his return, he received many social attentions from eminent citizens, especially Alexander Liberati, one of the outstanding cornet soloists of the day. La Guardia and Liberati maintained a warm friendship for many years. Another prominent musician with whom La Guardia associated was Carlo Alberto Cappa, trombonist, composer, and bandmaster of the 7th Regiment Band, which performed regularly at Central Park and Brighton Beach, New York. Cappa was highly regarded for his superb musicianship. La Guardia performed as cornet soloist with Cappa's "World Renowned" 7th Regiment Band; therefore, it can be reasonably concluded that he was an outstanding cornetist. Despite Achille's musicianship, he never was a regular member of any orchestra thus periods of unemployment were frequent and often lengthy. He refused to do the menial pick-and-shovel jobs filled by other immigrants, feeling that he was above that sort of labor. 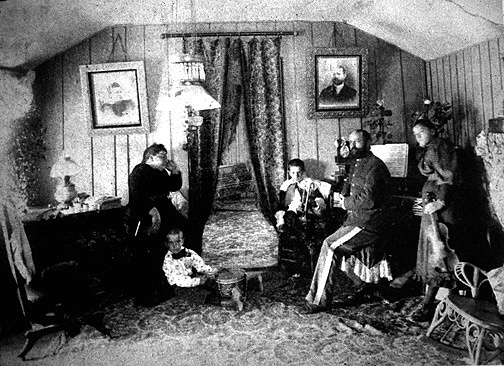 In March on 1885, the family visited the Luzzato's in Europe. That June, Achille left his wife and children in Trieste and returned to the United States to find work. In September of 1885, he enlisted in the Army and sent word for his family to join him at Ft. Sully, /south Dakota, where he was stationed as a member to the 11th U.S. Infantry Band. La Guardia claimed "no special privileges by reason of being married" concerning post assignments. The Army was most accommodating to this request, transfering him four times in seven years, often to remote frontier installations. Frontier life was the American way in 1885. Big headline news of that year included the death of Civil War hero Ulysses S. Grant; Sitting Bull, leader of the Sioux massacre of Custer's cavalry regiment, toured with Buffalo Bill's Wild West Show; Apache Chief Geronimo terrorized settlers and eluded 5,000 Federal troops and 500 Indian Scouts. In light of these facts, it is obvious that frontier forts such as Ft. Sully and others had not yet outlived their usefulness, the Army often representing the only form of law and order to the rapidly expanding Western migration. 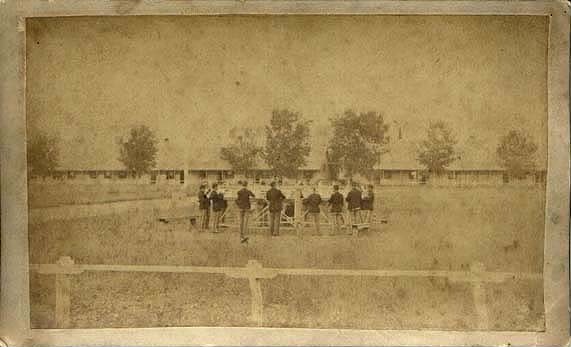 The 11th U.S. Infantry Band and Orchestra was a pleasing source of entertainment at Ft. Sully, and was always welcomed at social gatherings, dances, and 4th of July celebrations. The post band was first directed by a Mr. Clarke, but he was replaced by La Guardia who, on a concert dated March 26, 1886, programmed two of his own compositions, selections from Verdi's "Il Trovatore," and Suppe's "Waldtenfel." They brought her all kinds of gifts, such as hand made blankets, moccasins, beads, and Mother, in turn, gave them staples. The Indians spoke a Spanish dialect, Mother spoke Italian to them, and in this manner, they understood each other very well. Mother always said, 'No one is so well protected as I am', and she was right--the Indians would never have done her any harm. In the spring of 1887, Richard (named for Col. Dodge) was born. 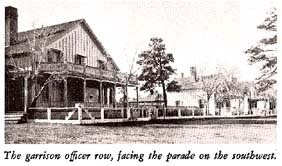 On August 9 of that year the 11th Infantry was transferred to Madison Barracks, Watertown, New York. This was an assignment in "civilized" territory, the Army's policy being to alternate infantry transfers so that not all were to frontier posts. La Guardia became popular in Watertown. He assembled a local band made up of town's people, taught numerous private lessons, and the Army orchestra offered free public concerts under his baton. A program from an open air concert dated Sunday, June 10, 1888 lists seven numbers played by the 11th Infantry Band, with "chief musician A. La Guardia, conductor." One of their selections, a march entitled "Dodge Hail," was written by La Guardia, most likely in honor of Col. Dodge. Unfortunately, this composition has been lost, the only record of its existence being the reference on this program. La Guardia and his 11th Infantry band were frequently hired by lodges for their social events. The Sackett's Harbor Lodge #135, F. & A.M. held a "Grand Jubilee" Wednesday, April 24, 1889. La Guardia is mentioned in the program as "on music,'' but no reference is made to the band or orchestra. Since it was typical during that period to hire local musical ensembles for lodge or civic events (if no lodge band existed), it may be concluded that the band or orchestra was present for the "Grand Jubilee." The locals in Watertown tolerated "Professor La Guardia's" fiery disposition, ascribing it to a combination of Latin and artistic temperaments. Such clemency might not have been exhibited had he not brought so much cheer to the community through his music. In the early autumn of 1890, the Infantry was transferred to Ft. Huachuca, Arizona Territory. This was definitely a frontier post. 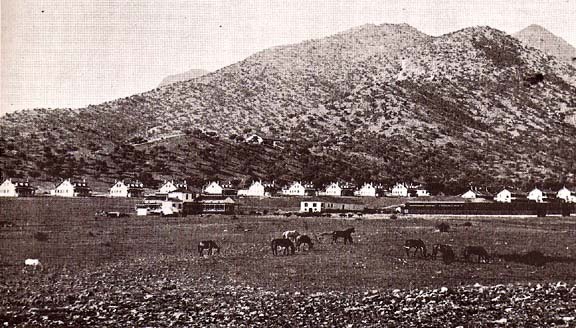 Ft. Huachuca was a dry mudhole of a stockade many dusty miles away from anything important. Accommodations for officer and enlisted man were equally spartan. The La Guardia home was a two-room adobe house with plank sides and floor. The kitchen was detached from the house (for fire reasons), also of adobe and plank, with a canvas roof. Various desert creatures were frequent and unwelcome guests. Winters were cold and often rainy, reducing the post to a slippery mud-sink of clay and loose rock. The terrain was stark and the summer sun merciless. The only bright spot in the drab routine was daily guardmount, which took place about 8:30 A.M. This was one of the highlights of the soldier's day. Companies assembled before their barracks and lined up for inspection. At second call, details were marched to an assembly point on the parade grounds and inspected by the post adjutant. As the band played some festive air, like "The Girl I Left Behind Me", or "The Secession Polka", the guard was formed and marched off to the guard house to relieve the old guard. With horses prancing and nickering and guidons cracking in the breeze, guardmount was a stirring spectacle. The band provided a daily lift of spirits for the troops during guardmount at Ft. Huachuca. Bands stationed at frontier posts may have been appreciated a bit more than those in more genteel surroundings. 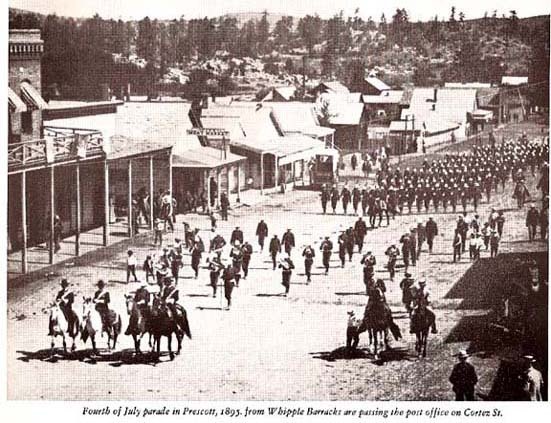 On May 4, 1892, the 11th Infantry received orders to remove to Whipple Barracks near Prescott, Arizona, a mountain town that owed its existence to the discovery of gold in the Pine Mountains during the 1860's. In 1892 there were 2,000 people living in Prescott, and the railroad was scheduled to link the town with Phoenix in 1893. Prescott was a frontier fort, but its cool pine surroundings and developing township made this installation much less dreary than Ft. Huachuca. Achille quickly became popular both on the post and especially in town, where he was regarded as something of a celebrity. Prescott had not previously seen the likes of "Professor La Guardia." He was dark-complected and handsome, well built but not tall at 5'6 1/2". His hair and eyes were black as were his magnificent beard and mustache, which he kept meticulously trimmed. In his dress uniform La Guardia looked like an Italian Duke. He was fluent in English, French, German, and Italian. Unshakable confidence was evident in all of his actions including his "grandiloquent signature." Popularity and social status are not synonymous. In Prescott, La Guardia was highly esteemed for his music and culture, but at Ft. Whipple, his music provided him with popularity only. 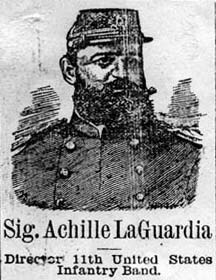 One source refers to Achille a "Major La Guardia"; however, all other sources indicate that he was a non-commissioned officer. At his third enlistment in 1895 at Whipple Barracks he was listed as third highest ranking N.C.O. at the post. This status placed the La Guardia's at a social disadvantage, as there was a clearly defined line of distinction between the West Point officers and the enlisted men. Although he taught music lessons to some of the officers and their families, La Guardia could not cross the social barrier. This discrimination carried over into the families as well, the officer's children and their wives remaining aloof from those of the enlisted men. This schism placed the La Guardia's in a unique position. Achille was not the typical sergeant. He was a musician--quiet, contemplative and serious. 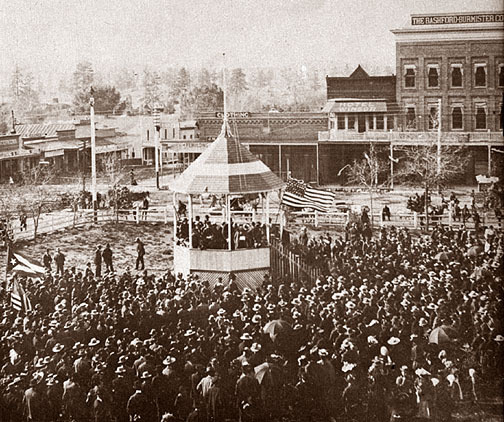 He had nothing in common with the other enlisted men who spent much of their free time (and paychecks) pursuing the various frontier amusements available on Prescott's "Whiskey Row." Thanks to Irene, the La Guardia's was a middle-class home, with pictures on the wall, drapes at the window, rugs, books, a piano, and various stringed instruments. Cultured guests from town visited frequently. 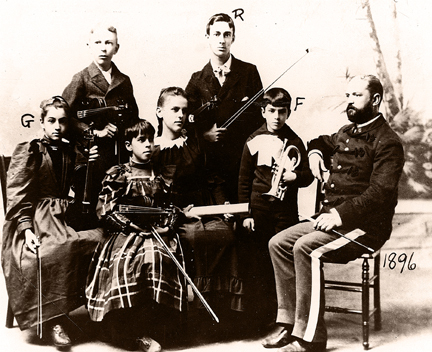 Irene and Achille considered themselves to be superior to all of the enlisted men, even though the quartermaster sergeant and the sergeant major outranked the chief musician. Father lived for music, and began teaching Gemma and me as soon as we could distinguish one note from another. Achille taught Gemma the violin and mandolin, Fiorello the banjo and cornet, and Richard the piano. Usually relaxed in discipline, La Guardia became a severe task master when it came to music lessons. He demanded much and criticized often, shouting at his children when they fell short of his expectations. He seldom admitted error, rarely complimented, and showed approval grudgingly. He instructed students and ensembles through criticism and wielded authority with harsh confidence. La Guardia wanted his son, Fiorello, to be a second John Phillip Sousa. He may have viewed Sousa as the ultimate success as he performed for presidents and toured the world. Achille provided music for military functions in all sort s of weather, usually for audiences of grumbling soldiers. Sousa's music became popular world wide, whereas, La Guardia's remained unknown except to the musically illiterate residents of frontier towns. La Guardia, who lived only in the vicinity of fame, undoubtedly viewed Sousa's fame with envy and admiration. When asked at one point to name his greatest desire, La Guardia replied, "to be renown." Perhaps his second Sousa ambition was fueled by prospects of becoming "renown" vicariously through Fiorello, whose mistakes spelled doom to the goal. took the audience by storm in his rendering of a cornet solo, receiving an enthusiastic encore. Little less was the demonstration of applause with which a violin solo, by Miss Gemma La Guardia, was received, she also receiving an encore. Achille formed a musical club comprised of his students and children, which presented many of his original compositions at local functions. The club had twelve members, and may have been "The Whipple Musical Club," the group for which he composed a piece bearing that title. The Army Band also performed at social gatherings, often providing dance music for "all who desire to 'trip to the light fantastic' [of] music by the Whipple orchestra." Achille La Guardia may never have recognized his success; however, local newspapers indicate that he was quite successful. Early in his military career, a Lowville, New York newspaper identified him as the most "competent director and composer of music in the U.S. Military service." Some years later, the Daily Arizona Miner-Journal compared La Guardia to Sousa, naming him a "remarkable counterpart [who] is rapidly reaching the front rank as a composer and leader." He was an excellent sight reader, capable of great accuracy and expression. He was also a prolific composer and derived great pleasure from rendering his own compositions. 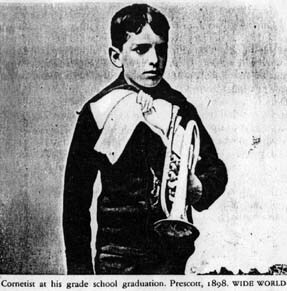 Old Prescott newspapers mention original compositions played by his students and musical ensembles at social events. There was a musical program delightfully rendered...a cornet solo was played by Master Fiorello La Guardia. It had been composed by his father and was entitled 'Eastern Star Polka,' and was dedicated to Gold- en Rule Chapter 1, Order of the Eastern Star of Prescott. When an exceptionally talented musician was transferred into the 11th Infantry band, La Guardia was quick to utilize him. Such appears to be the case with alto saxophonist William Gehle. 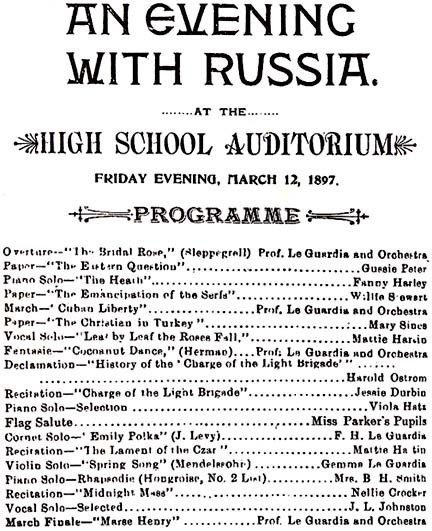 Concert programs for June and July of 1897 mention solos featuring him. La Guardia composed "Grand Fantasia," and arranged the popular song, "Pensez a Moi," most likely for Gehle. The Whipple Orchestra frequently provided music for Prescott's Elks Lodge, and the band appeared in parades for holidays. The Friday, May 28, 1897 Daily Arizona Miner-Journal includes instructions for parade line up order, with the Whipple band as the first unit, followed by various civic groups. The article continues to describe the plan for the Memorial Day service to be held at the cemetery with music by the 11th Infantry Band. In addition to performances at civic and lodge activities, the 11th Infantry band and orchestra presented outdoor concerts twice weekly, a tradition carried through from at least the Ft. Sully period. At Ft. Whipple, La Guardia and his band performed on Tuesday's and Friday's, with evening performances June through mid-October, and afternoon performances mid-October through June. Programs printed in the Daily Arizona Miner-Journal during 1897 offer insight into the diversity of the 11th Infantry band. The played transcriptions, dance music of all varieties, and military marches, some of which were composed by La Guardia. In February of 1898, the telegraph office in Prescott brought grim news: the U.S.S. Maine had been blown up in Havanna Harbor. War clouds brewed on the horizon and the 11th Infantry was placed on alert. Prescott's intrepid mayor, William Owen "Buckey" O'Neil, mustered volunteer troops to Ft. Whipple and in the last days of April, the Infantry plus twenty "Rough Rider" volunteers shipped out for war. The trains stopped first in St. Louis at Jefferson Barracks to settle families prior to moving on, the volunteers to Mobile, Alabama for further training, and the regular troops to Tampa, Florida. Leaving family behind is never easy, but with war's uncertainty, the prospect of soldiers not returning to loved ones touched many hearts deeply. The La Guardia's were not unaffected. Achille settled his family in Jefferson Barracks. Having only a few hours until time to board the train for Tampa, he was compelled by duty to say good-bye hastily. Gemma was Achille's only daughter, his "sunshine." Not being able to bear not seeing her father one last time, she dashed out of the house. Following the sound of the cornets and drums, she soon located the band as it played happy music to distract the people from their grief. Not waiting for the march to end, Gemma rushed into her father's arms, weeping. Fiorello, at age fifteen, was both too young and too small to enlist either as a soldier or a volunteer. He was successful, however, at persuading a newspaper to employ him as a correspondent, and he proudly departed for Tampa with the 11th Infantry. As events in Tampa unfolded, it was fortunate for the elder La Guardia that his son was with him. For many years, Achille had suffered from nose and throat irritations and some digestive problems. While in Tampa, he contracted malaria. Although these were problem enough, the final blow to his once hearty constitution was dealt by the Army. Corrupt contractors had sold tins of contaminated meat to the Army. Preserved with boric acid and nitrate of potash, this "embalmed beef" killed more American soldiers than Spanish bullets. Among the casualties was Achille La Guardia. After eating the tainted rations he was hospitalized with severe food poisoning. When he recovered enough of his strength, he and Fiorello returned to Ft. Whipple where Achille was given a medical discharge on August 22, 1898 due to "disease of stomach and bowels, catarrh of head and throat, and malarial poisoning." For this impressive list of miseries he received a pension of $8.00 per month. Father and son rejoined the family at Jefferson Barracks a few days after Achille's discharge. Now a weak, broken man, he took his family to New York City. Poor health prevented him from finding work. Frustrated, La Guardia moved his family to Trieste to live with his wife's widowed mother. Achille found work in the cartage business in Trieste, but this proved too strenuous for his deteriorating health. He then worked as a ship's provisioner for about two years, but this was not to his liking. In 1900, Achille leased an empty seaside hotel in Capo d' Istria. Within a short time he was operating a successful business. The venture became quite profitable, and in October of 1904, arrangements were being made to purchase the hotel. These plans were abruptly discontinued, however, due to La Guardia's sudden heart attack and death on October 21, 1904. Achille's grave is located in the Anglican cemetery in Trieste and is marked by a tombstone bearing the Masonic emblem, and reads: Achille La Guardia/ 1849-1904/ R.I.P. In Budapest, [where] I came from, there was a young man who was my brother's pupil, got hold of all my grandfather's music on the pretense that he is going to publish it. I never saw it again. La Guardia was a versatile musician. He was a talented composer and arranger, a band master, and cornet soloist. Had circumstances fallen in his favor, his name would be found among those of Gilmore, Pryor, Sousa, and Cappa, and he would have satisfied his desire to be "renown." Sheila Foraker plays cornet with the Territorial Brass and arranges music for band. Eric La Guardia is to be acknowledged for his assistance in the providing additional information and photographs. Mr. La Guardia is a professor of English at Washington University in Seattle and the son of Fiorello La Guardia.